A victory in taekwondo late Sunday marked China's 32nd gold medal and highlighted the Chinese storm that has swept over Athens. Chen Zhong beat France's Myriam Baverel 12-5 to win the women's over 67 kg taekwondo gold, the same medal she won in 2000. 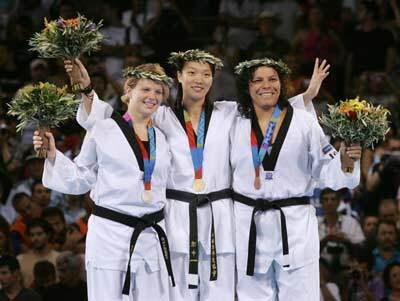 Zhong's victory all but drew the Athens Olympic Games, which started on August 14, to a close Sunday. The last two weeks have shown marked improvement in the overall level of China's athletes. 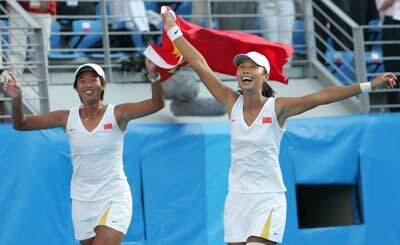 After the Chinese women's doubles tennis pair of Li Ting and Sun Tiantian upset a star-studded field to win gold, the Chinese contingent delivered one sporting miracle after another. The pinnacle came on Friday night when 21-year-old Liu Xiang became the first Chinese man to win an Olympic gold medal on men's 110m hurdles by matching the world record. 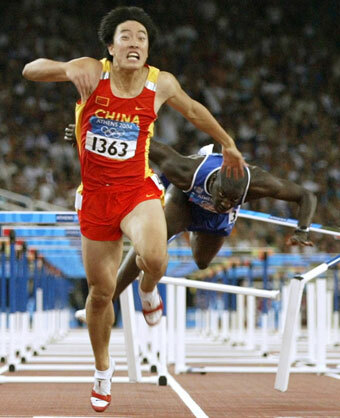 Although Liu had already established himself as a medal contender before heading into the Athens Games, his victory shocked the world because no Asian man could ever before steal the spotlight on track events traditionally dominated by Europeans and Americans. Just having a competitor among the last eight in a short distance track event was a first time for China. "Isn't it amazing?," sighed Scott Price, a senior writer from one of the world's leading sports magazines, the US-based Sports Illustrated. Price was writing a story on the rapid improvement of Chinese sports. Liu's accomplishments, he said, were among the most significant. "He is terrific," he said. "I think this could be the most important gold medal won by the Chinese athletes in Athens." The mixed zone, where journalists interview athletes after games, at the entrance of the Olympic stadium was swarmed with Chinese journalists for the first time since the track and field events opened on August 18. "I proved that Chinese people, Asian people and yellow-skinned people are able to do well in track events," said a proud Liu after his victory. Just when Liu was celebrating, another Chinese athlete Xing Huina, took the spotlight by winning the women's 10,000m with a power sprint at the last minute. "Definitely, the night here belongs to China," Price said. The Chinese storm continued to rage the following day as Meng Guanliang and Yang Wenjun won the gold medal on men's C2 500m in flatwater canoeing and kayaking early morning on Saturday. This is the first ever Olympic gold medal on the sport for China. Later in the afternoon, Luo Wei collected the second gold of the day for China on women's under 67-kilo taekwondo. China's women's volleyball team delivered a perfect end to the day, winning the gold medal, which eluded them for 20 years, by edging Russians 3-2 in a thrilling come-back final. The volleyball victory, marked China's 31st gold medal. "We did a wonderful job here," said Yuan Weimin, who led the Chinese delegation. "We achieved what we wanted in the best way." "There were many significant breakthrough made by Chinese athletes and the world has to take a new look on us." "In important events, compared to the United States, Russia and even Germany, we are still behind despite visible and rapid progress in recent years,'' Yuan said.